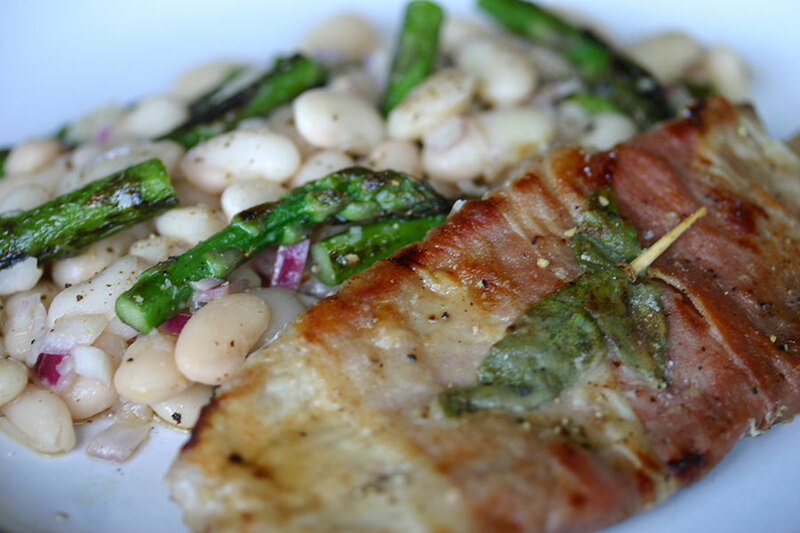 Saltimbocca means ‘jumps into the mouth’ in Italian, presumably because it’s so delicious. It is good! Traditionally made with veal, I came across this recipe for pork saltimbocca in an issue of Waitrose magazine. Actually it was the asparagus and cannellini bean salad that first caught my eye. The meat and salad combine beautifully to make a quick, tasty summer meal. Mix together the shallots, cannellini beans, vinegar and olive oil and set aside. Bat out the escalopes between two sheets of clingfilm to make them thinner, then wrap each one in a slice of proscuitto. Top with two sage leaves, and secure with a toothpick. Tip the flour onto a dinner plate and season with salt and pepper. Dust each escalope in flour, shaking off the excess, and set aside. Heat 1 tsp of sunflower oil in a large frying pan over medium high. Fry the escalopes for three minutes, sage side down. Turn and fry the other side for an additional two minutes, or until cooked through. Remove from the pan and cover to keep warm. Add the remaining teaspoon of sunflower oil to the frying pan and turn the heat to high. Stir fry the asparagus until cooked through and slightly charred. Add to the cannellini bean mixture and serve with the pork.